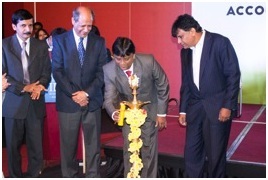 The inauguration started with the lighting of the lamp by our Guests and felicitating the guests. Dr. Madhumita Chatterji, addressed the gathering and passed a message that we are open to do any international research. Dr SharukhSaudakaran gave a brief history about FourA conference and he gave an excellent statement stating 2% of the net income of a company has to be spent on CSR that sums up to billions of dollars, so someone has to be aware of how that 4-5 billion dollars of money are put to use. Mr K Raghu stated China, Japan and other nations are trying to invest in India especially in Bangalore as it has the maximum startups in India. Mr Abdul Majeeden lightened the subject of supporting economic growth. Dr. Michimasa Satoh, Nagoya University, Japan/Dr. Jeanne H. Yamamura,University of Nevada Reno spoke about the Auditing in Japan. Vibha Tripathi, H.L.Institute of Commerce, Ahmedabad University spoke about Convergence of AS 14 Amalgamation to IND AS 103 Business Combination and carves outs from IFRS 3. 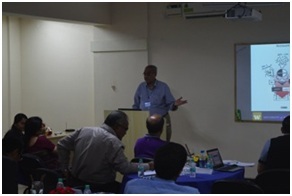 Many otherparticipants and academicians also gave their presentations on different topics. 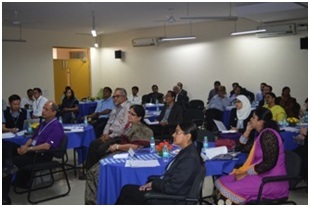 On 17TH October, The second day of the conference was held at the IFIM B-School campus. It was a great opportunity for the students to interact with the delegates and share little knowledge among them. 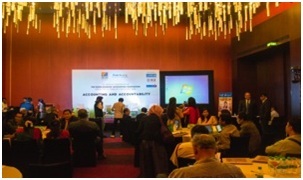 The FourA conference team had their Annual General Meeting towards the end of the conference. The Indonesian delegates gave a glimpse of where the next FourA conference will be held. 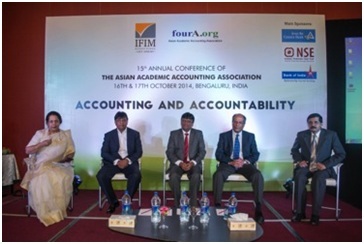 With that the Four A conference concluded on a very promising note.